These days people, especially women, appreciate lower calories and sometimes even portability in their cocktails. Happily, we’ve had some experts working on those very concepts. Here are two unique ideas that fit the bill perfectly. Let’s start with Slim Lizzy prepared light alcohol, low-calorie cocktails. I love the story behind the brand. Sean McGirr, CEO and Founder of Slim Lizzy’s, had over 35 years of experience in the juice beverage industry, including 19 years at the helm of North America’s largest bottler of store brand juices and drinks. One night in early 2013 after he’d retired, Sean took his wife out to dinner. Without a thought, he ordered his usual beer, but his wife was having trouble choosingc. She knew beer would make her feel bloated, wine would make her sleepy, a strong cocktail would leave her feeling too tipsy, and a sugar-infusedy drink would make her feel full. It was that moment when Sean decided that if there was ever an industry in need of disruption, it was the alcoholic beverage industry. They needed to learn to cater to their female customers. Look for Slim Lizzy’s for Fat Tuesday! After two years, Slim Lizzy’s 80-calorie pre-made cocktails in cans went to market. The Margarita has 2% fresh lime juice (with just the tiniest bit of metallic aftertaste), but it’s my favorite. The Cosmopolitan has 2% white grape juice and is a delicate pink with cranberry flavor—sweet like a Cosmo should be. Extra sweetness comes from a modest dose of sucralose. Compare the 80 calories in these drinks to the 150+++ in a typical Margarita or Cosmo. These little guys are also malt and gluten-free. These make good bases, too, for blending with other juices. A 5% alcohol cocktail alternative to high calorie, sugar-infused, bloat inducing beer and vodka drinks. What’s not to love? Get ’em at select Binny’s or check with your local liquor store or favorite tavern. And see what fun you can have mixing with these Slim Lizzy cocktail recipes. And here’s another fresh idea. LO! Fruit Blend beverages are the perfect fix for a little sweetness and fruity flavor. Drink ’em simply as juice or mix with your favorite spirit. Either way you get great flavor but don’t have to load up on calories and sugar (only 35 to 40 calories per 10-ounce bottle). 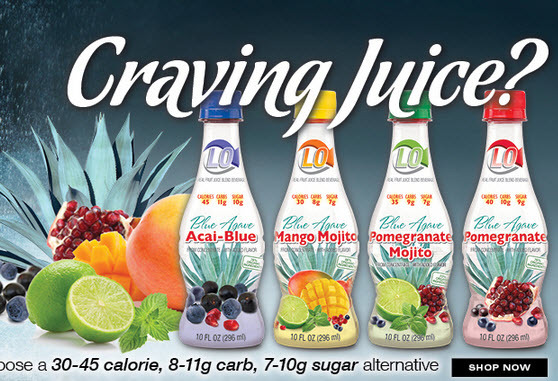 These non-alcoholic juice blends come in recyclable plastic bottles in four varieties: Mango Mojito, Pomegranate, Acai-Blue , and Pomegranate Mojito. What makes these special is that the calories are low because they’re made with agave nectar and stevia, both nature’s sweeteners that’ve been around for centuries. Plus, each variety has a low-glycemic index (great for diabetics and anyone else who likes to avoid sugar or artificial sweeteners). Get ’em at select Walgreen’s, Meijers and online. Shake with ice and strain over fresh ice. 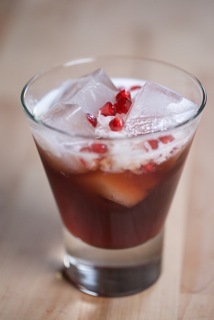 Top with a slash of coconut milk and a few pomegranate arils. 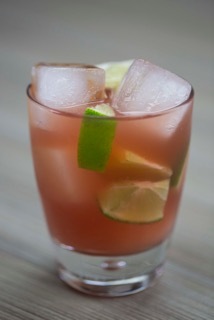 Combine all in a glass with ice and garnish with lime wedge. You’ll be delighted.